Trains depart from London Paddington and take approximately 3 hours, whether you travel via Newport, Gwent, or direct via the Malverns. Crunch is back, with the thought-provoking debate, infectiously danceable music and late-night parties that you've come to expect. But this year there's a whole lot more. We've doubled in size. With three new venues, a new art pavilion to explore, multiple musical events and performances running simultaneously across the weekend, Crunch 2011 is an essential date to enliven the darkening days of mid-November. Filmmaker Nicolas Roeg, artists Susan Hiller and Jake Chapman, novelist Mark Haddon, and Serpentine Director Hans Ulrich Obrist are just a few of the guests who'll be answering the big questions behind this year's theme, âAwake in the Universe'. We'll be exploring the role played by art and creativity in making us alive. 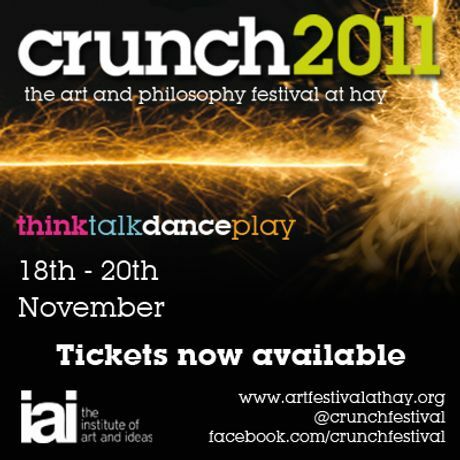 There'll also be music from the likes of stunning songstress Mara Carlyle, exhibitions from leading galleries and an array of comedy, cabaret and mayhem to ensure Crunch 2011 will be a weekend to overwhelm the senses.